Fresh vegetarian spring rolls are a quick, no-cook meal and are surprisingly easy to make. Spring rolls can be filled with just about anything, but this all-vegan recipe keeps it simple with your choice of noodles, thinly chopped cabbage, green onions, and bean sprouts with just a touch of Asian-inspired and Thai-inspired flavors - lime juice and soy sauce - to tie it all together. Fresh herbs are crucial to the finished spring roll, so be sure you have fresh cilantro, mint or basil on hand. Fresh Thai spring rolls are a great reason to use fresh mint and enjoy a unique and delicious flavor! Need these Thai-inspired fresh spring rolls to be gluten-free as well as vegetarian and vegan? Make sure to use rice wrappers, which are made from nothing but rice and water usually, and omit the soy sauce or substitute gluten-free Nama Shoyu or tamari. Toss together all of the ingredients (except the spring roll wrappers) in a large bowl. 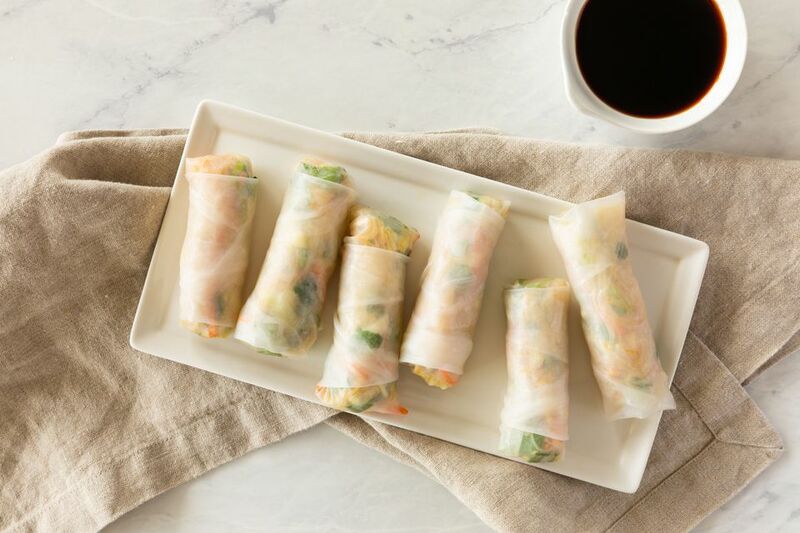 Submerge the spring roll wrappers in hot or very warm water just until pliable, which is usually up to 10 to 15 seconds. Place about 2 tablespoons of the vegetable-noodle-fresh herb mix on​ the wrapper horizontally. Fold the bottom of the wrapper up over the filling and push down. Fold in both sides of the wrapper and gently press and seal. Serve your vegetarian spring rolls with dipping sauce and enjoy!